Fall is a wonderful time of year – crisp cool days, blue skies, brilliant colored leaves. It brings relief from summer heat, football, and the start of school. It also brings opportunities for you to save. Here are six things we do in the fall that help us save money by using what we have, being energy efficient or maintaining our stuff so it lasts longer. 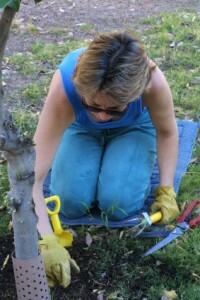 Make your own free mulch. Not only does mulch save money on watering, but it comes for the price of labor for us. We have lots of trees (think 6 acres of woods). Each fall as they fall, we scoop them and grind them using the lawn tractor. It has a huge trailer on the back that holds many bushels of leaves (you can also save money if you look for used tractors or other equipment). We pile these up in various places around our acres and use them as needed for mulch. Hang onto plants for winter greenery. Save your plants over the winter and avoid spending more money in spring. Now we have 3 huge ferns that we love to have on the porch in temperate weather. Instead of buying new ones each spring, I pull these into the garage (it is heated and has windows). Use free plants to landscape. When your daffodils bloom next spring, mark their location. After the leaves dye down, dig up the bulbs and re-plant in the fall. Daffodil bulbs multiply under ground each year – free bulbs for you! We have about 10,000 daffodils planted. Now it is time to reap the rewards! You can also divide most perennials, including plants such as hosta, phlox, hen and chicks, lavender and many more. If you, like us, have a thermostat that allows you to automatically schedule economy and comfort settings to avoid heating or cooling when you are away, make sure to check the time on it to make sure it matches your schedule and that the clock is actually set correctly. Pull out your furnace filter and either replace or clean it before winter sets in. Do this in spring as well. Your HVAC operates more efficiently with a clean filter and it only takes a few minutes to do. Check your home for potential heat leaks and find a way to cover the leaky area, either for the winter or permanently. If you don’t have double or triple pane windows, consider storm windows or lining them with plastic to better hold the heat. Patio furniture can last longer if you take care to prep it for winter weather. Remove cushions and store in plastic or a container. Examine metal furniture for rust and sand/paint with a rust restorer type spray paint to keep it in pristine condition. If you have concrete benches, clean them and spread some water seal on them. This prevents pitting and cracking and keeps them smooth and new looking longer. Clean your gutters as the leaves fall to prevent clogging, backup of water into your siding as well as sagging of the gutter itself. We watched our neighbors gutters fall off the roof because they were never cleaned out. Spend a little love on your car finish by waxing it to protect it from the coming winter road treatments, including salts. Although the new finishes are great, it gives me peace of mind to add a coat of wax each fall. Please share your fall savings tips in the comments. I remember my grandma always getting the bulbs, it doesn’t make sense to go back to the shop and buy some more! You can also store your potatoes and apples properly, they will last for months. Apples who spent the whole winter are a bit drier but very sweet. My Grandma used to store hers in an unheated room in the house. All she had to worry about were the ever persistent mice! Last fall, we added some extra insulation to our attic. I really think that it helped keep heat in our home last winter. I agree. We even have insulation in our interior walls – to cut down noise. It works. Great list! I’d add if you have a pool this is a good time to switch your filter system to work in the middle of the night to take advantage of cheaper electric rates. I didn’t know that electric rates are cheaper in the middle of the night! Good tips. You are correct about daffodils. The people who sold us our house had a bunch of daffodils in the center of the lawn. The lawn itself was pretty sparse and weedy, with no irrigation. We hired landscapers to come in and re-landscape both front and back yards. They put in irrigation systems, new soil, and lots of new sod. I asked them to take out the daffodils and other perennials that were in the old front yard. They took out most of the flowers and bulbs, but they missed some, and rototilled those into the dirt under the new sod. Of course, we had daffodils all over the lawn the next year. It took several years of pulling daffodils before they gave up. I hear you. Anything growing where it isn’t welcome is a weed – no matter how pretty! I’ve got the same problem with day lilies. Thank you for this solid tips. Autumn is my favorite season but that doesn’t mean I shouldn’t be gearing up to save some money.